The Perth Mint of Australia pays tribute to the quarter century history of an extremely popular series with the 25th Anniversary Platinum Koala Coin and Silver Medallion Set. This commemorative set includes a 1/2 ounce platinum Koala coin along with a 1/2 ounce silver medallion, just as it was first presented back in 1988. The maximum mintage for the set is limited to 1,200. On June 18, 1987, the Australian government initially approved the Perth Mint’s production of platinum and silver coins. Slightly more than a year later, the platinum Koala coin debuted marking the introduction of a series that would become one of the world’s most popular precious metal products. The line-up was expanded to include Koala silver coins in 2007. The reverse of the 25th Anniversary platinum Koala coin replicates the original 1988 coin design. It depicts an adult koala facing forward on all four paws. Surrounding the marsupial are the inscriptions of THE AUSTRALIAN KOALA, 2013 and 1/2 OZ 9995 PLATINUM. A unique ‘P25" mintmark indicates the 25th anniversary of the introduction of the platinum Koala coin. Offered on the obverse is the Ian Rank-Broadley effigy of Her Majesty Queen Elizabeth II. Obverse inscriptions include ELIZABETH II, AUSTRALIA and the legal tender face value of 50 DOLLARS. 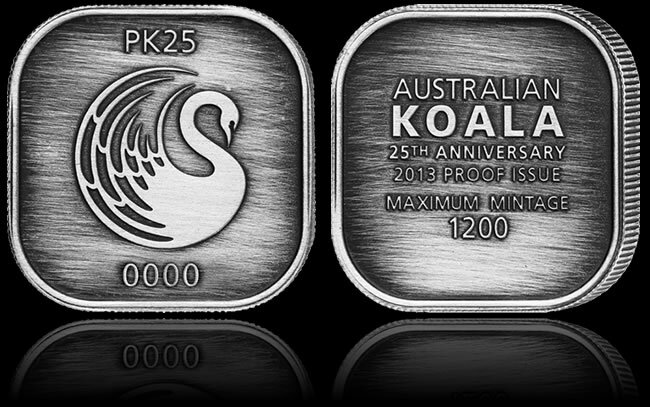 The silver medallion obverse includes the Perth Mint’s swan logo with the "PK25" mintmark and the mintage number. Shown on the reverse are the inscriptions of AUSTRALIAN KOALA 25TH ANNIVERSARY 2013 PROOF ISSUE along with MAXIMUM MINTAGE 1200. 25th Anniversary Platinum Koala Coin and Silver Medallion Sets are housed in a wooden presentation case. A customized shipper is also included along with a numbered Certificate of Authenticity. It was also 25 years ago when Johnson Matthey Hong Kong issued the Platinum Dragon Coin to celebrate the Chinese year of the Dragon (1988). Struck by JM Toronto and traded by a branch of the Bank of China they were extremely popular. To promote the coins there were two double decker buses and two trams painted with a purple background and platinum coloured Dragon. There was also a TV advertisment in English and Chinese — The Chinese voice chosen turn out to be very popular as he was also the Chinese voice of JR!! Thank you for the CoinNews. 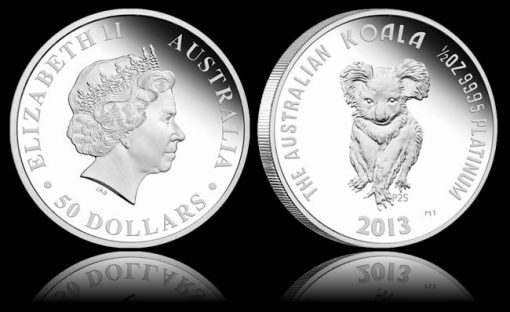 How one can purchase the Platinum Koala Coins from U.S.? Does South Africa issues Platinum coins? The New York Mint might be the exclusive US distributor of this coin. They are selling them at a significant amount above the Perth Mint price. If you can find someone who can buy it directly from the Perth Mint and ship it to you that will save you around $1,500. NYM is selling the 1/2 oz Platinum Koala with an NGC-PF70 grading for $3,495.